NORMAN – University of Oklahoma head soccer coach Matt Potter and Vice President and Director of Intercollegiate Athletics Joe Castiglione released Oklahoma’s 2018 soccer schedule Tuesday. The Sooners will play 18 regular season contests, including 10 home matches on John Crain Field at the OU Soccer Complex. Following a road exhibition match at North Texas on Aug. 10, the Sooners will kick off the regular season by welcoming Nebraska to Norman on Aug. 16. OU will also face Illinois State (Aug. 24), Gonzaga (Aug. 26), San Francisco (Sept. 7) and California (Sept. 9) in home non-conference contests. Sooner Sports TV will again broadcast all of OU’s home matches live. The Sooners’ home schedule also includes five Big 12 matchups. OU will welcome Texas Tech (Sept. 28), Oklahoma State (Sept. 30), TCU (Oct. 5), Iowa State (Oct. 19) and West Virginia (Oct. 21) to John Crain Field. In road conference contests, OU will take on Kansas (Sept. 21), Kansas State (Sept. 23), Texas (Oct. 12) and Baylor (Oct. 25). OU’s non-conference road schedule includes matches against Oklahoma State (Aug. 19), Texas A&M (Aug. 31), Utah (Sept. 13) and Utah Valley (Sept. 15). Eight of OU’s 2018 regular season opponents competed in the NCAA Tournament last year, including quarterfinalist Baylor, California, Oklahoma State, TCU, Texas, Texas A&M and West Virginia. Exhibition foe North Texas also advanced to the tournament. 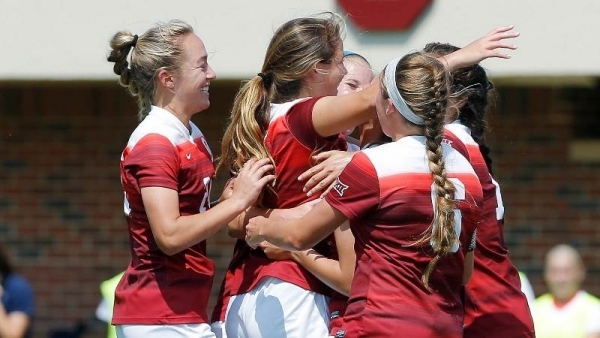 The Big 12 Championship will again take place at Swope Soccer Village in Kansas City, Mo., the sixth straight year the venue will host the event. The conference’s top eight teams will compete in a single-elimination tournament from Oct. 28-Nov. 4 as they vie for a Big 12 title and an automatic bid to the NCAA Championship. Season tickets for the 2018 Oklahoma soccer campaign are now on sale to the general public. Fans can order online via SoonerSports.com or over the phone at (405) 325-2424 or toll-free at (800) 456-GoOU. The season ticket package costs $50 for adult general admission. Faculty and staff, letterwinners, youth (6-18) and senior citizens (55+) can pick up season tickets for a discounted rate of $40. All seating is general admission. Single-game tickets will be available starting Aug. 1.